An evening of brilliant theatrical extremes awaits with Hope Mohr Dance’s newest program, showing this weekend at ODC Theater. Celebrating their ninth home season, the company’s double bill brings two diverse compositions - a world premiere dance theater wonder paired with a more abstract, conceptually enigmatic, choreographic opus. Hope Mohr’s Manifesting was one of the best dance theater works that I have seen in a long time. Not only is it a smart, witty and complex marriage of movement, music (by Beth Wilmurt), text and design, it is highly entertaining and engages the viewer from beginning to end. And achieving both of these goals matters. As such, Manifesting is quite an important addition to the oeuvre of dance theater. In the program notes, Mohr shares that this new piece is “inspired by artist manifestos…” and to that end, Mohr has crafted a distinct container to explore the creative mind and its process - what drives it, what it wants, what it rejects, what it chooses, what it discards and what it ruminates on. Folding tables were arranged in a C-formation on the stage; mikes, masks, papers and books layered on each. The scene reminded of a table read for a play, a space for a cast to workshop ideas and material. And workshop they did. 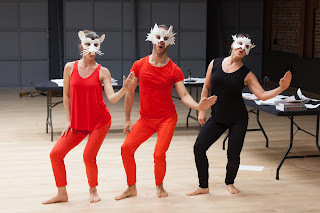 They challenged and revealed themes of viewership, expectation and judgment; they posed internal and external questions of themselves and their work; they donned animal masks (by Tiffany Amundson) and recited excerpts from iconic artist manifestos, including Yvonne Rainer’s 1965 ‘no manifesto’. All in an effort to crystallize their own creative desire. But in true dance theater fashion, there was no resolution to the story, and that was wonderful. Manifesting allowed its audience to glimpse and witness an active process, unfolding over a specific period of time and in this particular space. Compositional devices of accumulation, repetition, appropriation and development factored strongly in Manifesting. As did a dynamic interplay between the performers – combative/competitive in one moment and supportive/intimate in another. The movement vocabulary had a similar breadth and diversity, ranging from compulsive athleticism to primal physicality. This, combined with the masks, provoked an interesting comment on the space between the animalistic and the cerebral. And the music definitely deserves special mention. Wilmurt took us on a stylistic journey from chant to swing to musical theater, and the company delivered at every turn with their phenomenal vocal performance. On the other side of the spectrum sits Mohr’s Stay (2015), a non-narrative choreographic response to Francis Bacon’s paintings. In vast contrast to Manifesting, the stage was open and uncluttered with bright blue flats and mobile neon green arrows. Onto this landscape Mohr created an array of evolving physical architecture as bodies shifted in and out of a series of image-based scenes. While Stay is certainly not story-based, to say it is completely abstract doesn’t feel quite right either. Because there was tangible emotion, and identifiable moods at play. Tender motifs, like when James Graham’s foot gently caressed Parker Murphy’s cheek. Or the more dark and foreboding atmosphere of dancers appearing to devour each other’s hands. For me, the most intriguing aspect of Stay was the dancers’ roles in the various vignettes. How Mohr injected active and passive participants in much of the staging. And how that structural intention changed the imagery and the visual perspective. Stay is also a very technically demanding, dance-filled work. Balances held in complicated off-center positions, extensions beginning when the body is upside-down. The talented cast communicated this challenging choreography with acuity and fervor. Stay was an encore from last year, so I completely understand why it closed the program. World premiere first, returning piece second. But with the nature of each individual work, it seemed that the reverse order would have made more sense. "Dance As Text: Ideologies of the Baroque Body"